BIBENE collecting all the review and feedback of our alarm product and move its step to invent a system which can be flawless and affordable to all of our customers. Here comes our W20 WIFI+GSM alarm system. For the past few years and based on our product line, we figured out that the most important thing that our customer wants from the alarm system is instant push notification. However, most of our WIFI product may have bad WIFI connection problem and lead to late push notice, hence, W20 enable itself with one more way to receive notification when the emergency happens. While You're Out, Don't Let Them In. Arm your system remotely from our APP anywhere, or set it into auto arm or disarm that fits your needs. That's how BIBENE W20 home alarm security systems keep you and your entire home safe and secure. Meanwhile, the touchpad is designed to easy use by our senior customer. Get W20, get yourself a safe and smart home. 1.This system compatible with most TP-LINK and D-LINK router, but ONLY fit with the 2.4Ghz router. Please make sure your router is 2.4Ghz before purchase. 2.We recommend our user to power the panel by DC at daily use, back up battery is ONLY for emergency. 3.Please check more accessories in our store and if the sensor doesn't work, please change the battery and try again. 6. The manual comes with the product is only for APP control, please download the full version from our listing. ★2018 Best Buy Alarm System★W20 alarm system will be your 2018 best buy and won' t regret to get it! 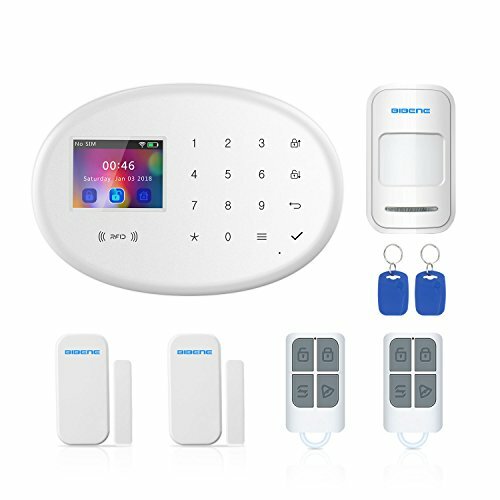 Super large DIY security system with 2.4 inch TFT color screen and touch buttons, 99 defense zones, and moreover, you can add up 20 smart socket & wireless siren! W20 realize your smart house dream in one second! SIM Card DO NOT Included. ★WIFI+GSM Alarm System★ No more worry about bad WIFI connection. W20 has two-way to push notification, when under bad WIFI connection or power cut-off, W20 will send notification via message or phone call to you which keeps your house guarded in 24/7. This system also features a two-way voice intercom system which immediately connects you with a real person. Please insert SIM card into the alarm system and save the contact number to panel first. ★Perfect System for Elder★BIBENE cares a lot about our elder customer. The medical alert mode in our home alarm security systems will send the notification to user even under disarm status which can be well-protected elder and children. User can also record the SOS recording in advance, when elder press SOS button, the system will call you and play the recording to inform you of the emergency. ★Simpler, Faster and Stronger System★ W20 use simpler control system and upgraded edition that allows this system can be used by all aged. Customers can control their whole home simply from a single screen. BIBENE APP also allows you to put your home's security and access and comfort at your fingertips. If you have any questions about this product by BIBENE, contact us by completing and submitting the form below. If you are looking for a specif part number, please include it with your message.